Berggruen Gallery is pleased to present an exhibition of new paintings and works on paper by Alicia McCarthy, on view March 16 – April 22, 2017. The gallery will host a reception for the artist on Thursday, March 16 from 5:00–8:00 p.m.
McCarthy is considered an integral member of the Mission School, a group of young San Francisco artists who were associated with the San Francisco Art Institute (SFAI) and who worked in and around the Mission District in the early 1990s. Working at the intersection of craft/folk art and urban street and graffiti culture, this core group of artists cultivated an artistic practice that prized the handmade and the local in an increasingly technologized society. 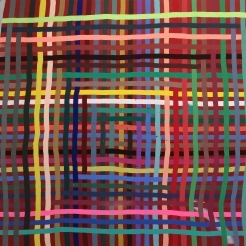 The weave pattern, a predominant motif in McCarthy’s work, however playful and seemingly simple is layered with complex formal and sociological meaning. The highly geometric and structured forms of her designs belie their subtle intimacy. The presence of the artist is unmistakable and manifests in such physical markings as doodles, handwritten notes, water-stained rings left by mugs or cups, or even McCarthy’s own painted fingerprint or the sole of her shoe. These “autographs” imbue each painting with a deeply personal quality. The uniqueness of each mark also serves to enhance the overall formal composition of the painting, providing visual intrigue in the form of small splatters or stains of color. McCarthy’s drawings in particular, often created using scrap or recycled construction paper, exploit the imperfections of her materials. 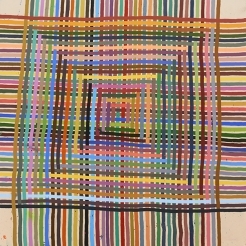 For example, the discoloration of a pink sheet of paper, the edges of which have faded to orange over the course of time, is utilized by McCarthy as the base for a weave drawing in blue colored pencil. The effect is mesmerizing—a simple sheet of blemished paper is transformed into a vibrating rainbow of formal intricacy. The weave motif is but one example among the many different bodies of McCarthy’s work on view in the exhibition. Her spectrum drawings appear as prismatic explosions of colored bands radiating from a single origin point. The basic structure of McCarthy’s weave and spectrum compositions naturally elicits a conversation between colors at the boundaries where they intersect. Arguably, McCarthy’s work is a new iteration in the legacy of color theory as espoused by such art historical titans as Josef Albers and Michel Eugène Chevreul. Though the artist maintains that she has no formal background in color theory, her work nonetheless suggests a close relationship to this oft-discussed theme. Color theorists such as Albers have long investigated a certain phenomenon in visual perception wherein colors, when observed adjacently, influence one another. Albers in the introduction to his 1963 treatise, Interaction of Color, writes: “In visual perception a color is almost never seen as it really is—as it physically is. This fact makes color the most relative medium in art. In order to use color effectively it is necessary to recognize that color deceives continually.” Albers, known for foregrounding discussion of the active role of the brain in the perception of color, finds a kindred spirit in McCarthy. The social connotation of her weave and spectrum designs is also noted by the artist. Her colors, like individuals, influence each other and together combine to form something greater. In McCarthy’s work, abstract form becomes a metaphor for belief. Alicia McCarthy (b. 1969) received a BFA from the San Francisco Art Institute in 1994 and an MFA from the University of California at Berkeley in 2007. McCarthy has very recently been honored in 2017 as a recipient of the SECA (Society for the Encouragement of Contemporary Art) Award, and as such her work will be featured in an upcoming exhibition at SFMOMA this July. She was also one of fifteen Bay Artists commissioned by Facebook in 2015 to create a site specific spray paint mural for their new Frank Gehry-designed Menlo Park headquarters. McCarthy has received numerous accolades and residencies, notably from the Skowhegan School of Painting and Sculpture, New York; Headlands Center for the Arts, Sausalito; Artadia, San Francisco; and New Langton Art, San Francisco. Her work is featured in public and private collections worldwide, including MIMA the Millennium Iconoclast Museum of Art, Brussels; American Academy of Arts & Letters, New York City; and the Oakland Museum of California. Recent solo and two person exhibitions include Snobody: Alicia McCarthy, V1 Gallery, Copenhagen; Fertile Ground: Art and Community in California, Oakland Museum of California; Alicia McCarthy + Jenny Sharaf, Johansson Projects, Oakland; Energy That Is All Around, Mission School: Chris Johanson, Margaret Kilgallen, Alicia McCarthy, Barry McGee, Ruby Neri, San Francisco Art Institute and Grey Art Gallery, New York University. McCarthy lives and works in Oakland, California. Alicia McCarthy, March 16 – April 22, 2017. On view at 10 Hawthorne Street, San Francisco, CA 94105. Images and preview are available upon request. For all inquiries, please contact the gallery by phone (415) 781-4629 or by email becky@berggruen.com. John Berggruen first opened his pioneering gallery in the spring of 1970 on Grant Avenue in downtown San Francisco. Berggruen Gallery opened in its new 10,000-square-foot space at 10 Hawthorne Street, an historic three-story brick building across from the recently expanded San Francisco Museum of Modern Art, on January 13, 2017. The gallery specializes in contemporary art and 20th-century American and European paintings, drawings, sculpture, and limited edition prints. The gallery exhibits the work of major American post-war artists as well as established and emerging contemporary artists, such as Alicia McCarthy, Julie Mehretu, Richard Serra, Mark Tansey, George Condo, Bridget Riley, and Tauba Auerbach. In addition, Berggruen Gallery presents curated exhibitions of historic works by artists such as Ellsworth Kelly, Alexander Calder, Henri Matisse, Ed Ruscha, Frank Stella, Georgia O'Keeffe, Mark di Suvero, Willem de Kooning, and Wayne Thiebaud. The gallery also specializes in the work of Bay Area Figurative artists Richard Diebenkorn, David Park, Nathan Oliveira, and Elmer Bischoff.